Wednesday Webs: June Dairy Month! June is Dairy Month and what better way to celebrate than with some good Wisconsin cheese! I stepped into Madison’s Fromagination yesterday and was like a kid in a candy store. 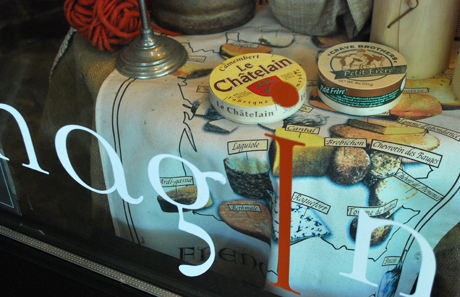 Artisan cheese, beer, wine, chocolate…what more does a woman need? Pleasant Ridge Reserve, by Uplands Cheese: This cheese was featured on the Wisconsin Foodie show. It’s every bit as good as they said! Dunbarton Blue, by Roelli Cheese Haus: Straight blue cheese is too strong for me (I’m a whimp) but this blend is so-o-o delish! It’s a cheddar cheese laced with just enough blue to give it intrigue. Here’s an interesting article on how they do it. I wrote about Crave Brother’s successful marketing here, but that’s not all they do. They’ve come up with a heavenly mascarpone that makes the best desserts! Brunkow Cheese Curds: A Saturday morning stroll around the capitol square at Madison’s Dane County Farmers Market isn’t complete unless you’re dipping into a bag of squeeky-fresh cheese curds! Kraemer’s Sharp Cheddar: Good ol’ cheddar cheese may be a Wisconsin stand-by, but it’s one you can’t do without. Aged 3 years, 5 years or 8-10 years, they’re all oh-so-tasty. Want the slice on Wisconsin cheese? Check out this cheesy-in-a-good-way blog.